The third and final EL FARO hearing has been scheduled for February 6, 2017 in Jacksonville, Florida. 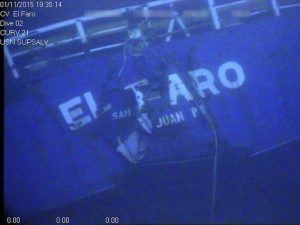 The Coast Guard Marine Board of Investigation will focus on crew witnesses, TOTE company officials, Coast Guard officials as well as the contents of EL FARO’S voyage data recorder (VDR). The transcript of bridge audio recordings was released on December 13, 2016, by the National Transportation Safety Board (NTSB). The examination of data from the voyage data recorder began on August 15, one week after the device was located at a depth of 15,000 feet and brought to the surface. NTSB recovered about 26 hours of information from the device, including bridge audio, navigational data, onboard radar images, route planning and wind data. The investigation seeks to determine which factors contributed to the sinking, and will look for evidence of misconduct, inattention to duty, negligence, willful violation of the law by any licensed or certified person, as well as whether there is any evidence that Coast Guard personnel or any government employee contributed to the accident.